On June 22, 2013 NPR’s Weekend Edition radio program focused its attention on the use of peer mediation and restorative practices at Ypsilanti High School in Michigan as a tool to prevent or reduce suspensions and dropouts. The show is archived here. Slides from the conference are now available on the CRE conference presentations page. The listing below is organized by presentation date (as best I could sort it out). Presented by: Claudia Maffettone, Soliya Inc. This recent qualitative dissertation project by Maura Dillon provides ideas about how to create peer mediation programs that are both realistic and maximally beneficial. The research involved reviewing recommendations made in the professional literature for creating successful programs and soliciting practical perspectives on these recommendations by interviewing five middle school counselors currently coordinating peer mediation programs. Partnership with Children, a New York-based, not-for-profit agency, faciltated a first-ever virtual Peer Mediation Summit via Skype on Wednesday, May 25 with students at Golightly Career and Technical Center in Detroit and the students at Global High School in New York City. 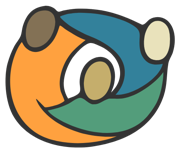 The non-profit has been working with six Detroit schools to bring its extensive experience in the area of social and emotional learning to nearly 100 inner-city Detroit students, including leveraging the free video conferencing technology, Skype, to train and monitor teachers in collaboration with Partnership with Children’s Center for Capacity Building. The event included a Q&A where Detroit and New York City Public School students asked brief questions about each other’s experience with peer mediation, schools and cities. Students will also participate in “Peer Mediation Jeopardy: Detroit vs. New York City” and then engage in a “Peace Pact” to discuss how they are going to use Peer Mediation in their everyday lives. The program is part of the DPS Conflict Resolution Initiative, a $2.5 million program aimed at equipping students, teachers, principals and parents with the skills needed to resolve school-based conflicts, increase tolerance and ward off behaviors that can lead to bullying. Every school in the district is being paired with a partner company that will work alongside school staff to implement the initiative, which is being funded through Title I, Title IV and the American Recovery and Reinvestment Act of 2009 (ARRA). The Event Media Advisory provides more details. As part of our website summary report for our FIPSE subcontract we developed a quick online timeline of some of the project highlights from the past 3 years. A recent episode of the weekly Classroom Closeup New Jersey show featured a group of first graders who have been learning about problem-solving by using a peace bridge that was painted on their playground. At North Boulevard Elementary School in Pequannock Township New Jersey, Yvette McBain (Morris County Teacher of the Year) has developed a peer mediation program whose theme is “A Bridge to Success,” which includes the 1st through 3rd grade Peacemakers, and The 4th and 5th grade Heart Club peer mediators. You can view the episode here. Here’s a diagram of the bridge that was painted on the playground. It provides visual and verbal cues to help the students solve their problem. McBain’s classroom also has a song that reinforces the steps in the process. Combating bullying is not going to be easy, but it’s definitely not going to happen if we don’t dive deep in the mess that underpins it and surrounds it. Lectures by uncool old people like me aren’t going to make teens who are engaged in dramas think twice about what they’re doing. And, for that matter, using the term “bullying” is also not going to help at all either. We need interventions that focus on building empathy, identifying escalation, and techniques for stopping the cycles of abuse. We need to create environments where young people don’t get validated for negative attention and where they don’t see relationship drama as part of normal adult life. The issues here are systemic. 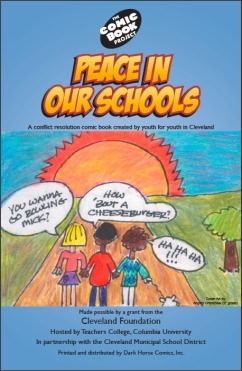 Students in the Cleveland Municipal School District helped create this special comic book created by youth for youth. Through a grant from the Cleveland Foundation, children in public school classes across Cleveland came together to take a stand against violence in school and in the city. The comic book that resulted is found below. The book is part of a larger series sponsored by the Comic Book Project. You can visit the project website to see books created elsewhere and to learn about how your schools might get involved. The Examiner.com web network of syndicated writers now has a Conflict Resolution and Character Education examiner providing stories, role-plays, articles, and lesson plans. Lots of downloadable content of interest to teachers. The author is Debbie Dunn. Dunn is a professional storyteller, published author, a Conflict Resolution Specialist, and a Certified Teacher. She taught 14 1/2 years in elementary and middle school. She tells stories and writes full-time from her home in Mosheim, TN. Find out more here. Filmmaker and founder of the UK-based nonprofit Peace One Day (POD), Jeremy Gilley, today announced the distribution of a free online educational curriculum and film to schools teaching grades 6-12 in 11 US states. The program includes 21 lesson plans helping teachers and students to explore such issues as conflict resolution and nonviolence, using Peace Day, September 21 as a focus. Additionally, all grades 6-12 classrooms are invited to participate in a special LIVE webcast held in New York City on March 19, 2010, at 1 p.m. EDT to inspire students to make a difference in their school, community and in the world. Jude Law, Ambassador of Peace One Day, will be joining Jeremy and special guests live on the day via Skype. The online curriculum is available at www.peaceoneday.org. In 2001, September 21 was unanimously adopted by UN member states as an annual day of global ceasefire and nonviolence. In September 2009, the US Senate unanimously passed a resolution which recognizes September 21 as a global day of peace. The Peace One Day curriculum fosters discussion and projects among young people about peace and nonviolence in their schools, local communities, and the world at large. The online curriculum is designed to be used in conjunction with Gilley’s award-winning documentary film The Day After Peace, a compelling documentary charting one man’s journey to establish September 21 as Peace Day. Thirty thousand free copies of the film will be delivered to middle schools and high schools this month. Peace One Day’s educational curriculum and DVD are being distributed in association with Scholastic, the global children’s publishing, education and media company, and underwritten by long-term supporter Ben & Jerry’s. The seventh annual No Name-Calling Week (NNCW) is in full swing! Thousands of educators are leading their students through educational and creative activities aimed at ending name-calling, bullying and harassment in schools. If you haven’t already, it’s not too late to conduct NNCW activities in your school. Some simple ways to celebrate are developing an anti-name-calling classroom policy or screening a student-made anti-bullying video. For more tips and ideas, visit the NNCW Resources page. The deadline for submissions is Friday, February 26. Over 5,000 NNCW fans are talking about name-calling and bullying on the NNCW Facebook page. Join the conversation on Facebook and talk with other educators participating in NNCW to share tips and ideas. Visit http://www.nonamecallingweek.org to register for updates, download free lessons and planning tips, and learn more about this year’s Creative Expression Contest. Teachers.tv, the U.K-based education support website has a number of videos that follow two brand new teachers as they work their way through their first year of instruction at inner-city schools in London. A good resource for talking with pre-service teachers about issues they may face, and perhaps a motivator to encourage students to take CRETE workshop training seriously as part of their preparation for teaching service. The first video in the series, entitled Early Days, introduces us to the teachers and their backgrounds, and explores issues like preparing the classroom and dealing with pre-term nerves. Of particular relevance for CRETE folks is the second video on Managing Behavior that explores some of the real difficulties these two NQTs (Newly Qualified Teachers) are having as they start to work with their classes. Next in the series is Settling In wherein the new teachers do some assessment regarding how they are doing at the mid-term break. They worry about the stress and it’s impacts. We stay with the same teachers (Tara and Rosie) for another episode entitled Work/Life Balance where we learn more about the ups and downs of their experience. Edutopia has a nice overview of a program focused on reducing bullying and violence on school campuses. The program, known as Safe School Ambassadors, enlists students, who after training, work more or less anonymously to discourage bad behavior among their peers. You can read more about it here. A video from the Today Show features one Florida school’s implementation of the program. Readers may be interested to know that a number of [url=http://www.creducation.org/index.php/section/single_entry/australian_values_ed_reports/]new research reports on values education work in Australia[/url] have been described and linked over in the Researcher’s Blog.